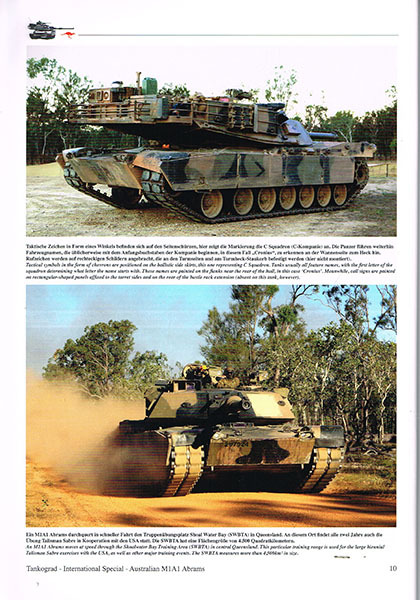 In the early 2000s, the Australian Defence Force (ADF) began searching for a new tank to replace its aging fleet of Leopard AS1 vehicles, which had been in service since the 1970s. ADF currently fields 59 M1A1 AIM SA Main Battle Tanks, plus 13 M88A2 HERCULES recovery vehicles, known in Australian service as ARVH (the ‘H’ stands for ‘Heavy’). The vehicles were purchased as part of Foreign Military Sales agreement in 2004, and were delivered in 2007. 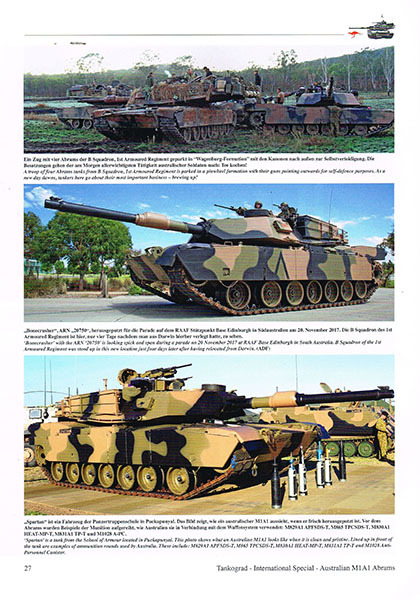 The original order included only 7 M88A2s, but a further 6 were procured in 2015 to meet expanded requirements after the ADF reorganized under Plan Beersheba. 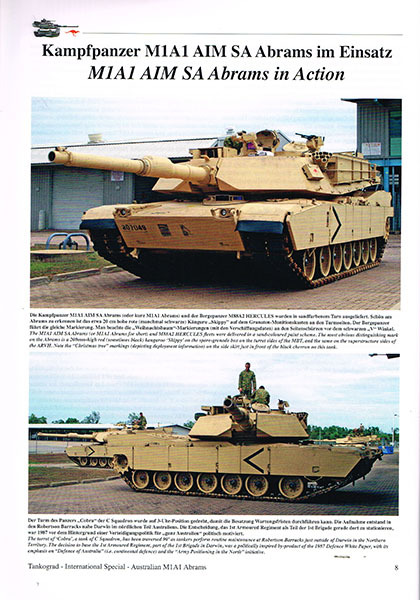 The Abrams were former US Army vehicles, remanufactured to then-modern specifications, and have undergone several upgrade programs while in Australian service, the latest in 2017. They have been fitted with several features unique to Australian vehicles, such as a refrigerator mounted on the turret bustle rack along with its power receptacle, and a tank-infantry telephone. They also include a number of updated features such as reconfigured engine deck with 'under armor' APU. Gordon Arthur’s latest book provides us with an overview and extensive photographic record of the M1A1 Abrams in Australian service. The book is in Tankograd's usual A4-sized, soft-cover format, with 64 pages and 153 color photographs. The first 6 pages are filled with well-organized text covering the purchase, organization and modernization programs. All text is in English and German. 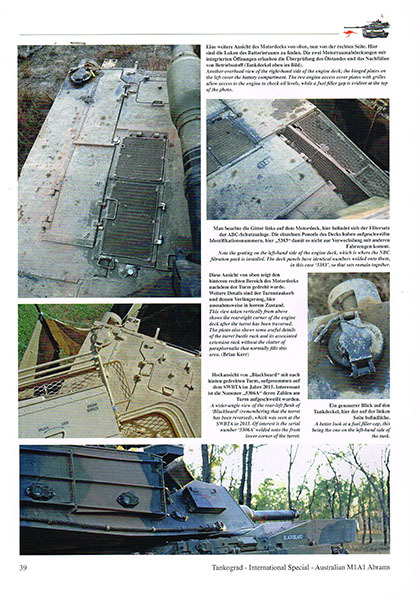 The next 26 pages provide ‘in the field’ photos of the M1A1 in Australian service. The photos include several shots of the M1A1s in the sand colored scheme in which they arrived from the USA, though most are in the AusCam three-color camouflage scheme of green, tan and black. All captions are in both English and German. This section is followed by 17 pages of detail ‘walkaround’ photographs. 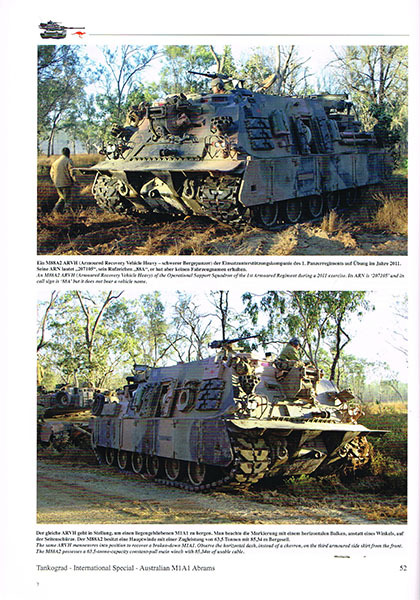 This in turn is followed by 5 pages of photographs covering the M88A2 in Australian service. 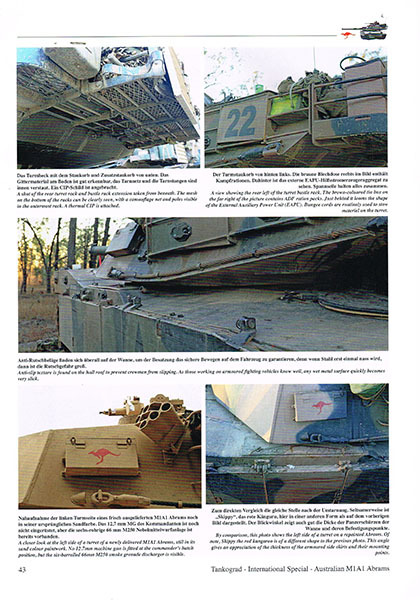 The final 9 pages include photographs of various combat support vehicles that serve alongside the M1A1s, such as the MAN Heavy Tank Transporter and the M113AS4. As you can see from the sample pages shown above, all photographs are in full color and clearly reproduced. Most of are one-half or one-third of a page, some are full-page and there are several two-page spreads. Many of the ‘walkaround’ photographs are smaller but are still of sufficient size that the reader can easily spot details. The book provides a concise, well-written and copiously illustrated reference for anyone wanting to model an M1A1 in Australian Service. Most sources agree that DML’s M1A2 SEP kit is the best starting point in 1/35 scale, but you will still have to make some modifications to add the external refrigerator and umbrella mount to the turret. Arms Corps Models did a resin conversion but it has been out of production for a long time, so you will need to resort to some scratchbuilding. Mouse House Enterprises in Australia provides the correct AusCam paints and marking stencils, while Echelon Fine Details produces markings. Thanks goes out to Tankograd Publishing for the review sample.